In a recent post on his SASdummy blog, Chris Hemedinger featured some add-ins for Enterprise Guide 4.1 that allow import and export of files from JMP, Stata and SPSS. These were written by Chris (using PROC IMPORT and EXPORT) and are available for download. These add-ins are not supported, but the same functionality will be shipped with EG 4.2 - supported. Chris's post left me wondering how many other EG add-ins might be available "off the shelf" on the web. Ideally for free! I stumbled across an interesting new style of chart the other day (it was new to me, it may not be new to you). The Marimekko chart shows three levels of data within a simple 2D representation. Indeed, by stacking the bars in the chart, one can achieve four levels of data. I found the chart in a (long) article explaining how to create Marimekko charts in Excel; I was pleasantly surprised to find that SAS has a PROC (since V9) for creating these charts: PROC GAREABAR. Rob Allison shows a good example of usage of these charts on his web site. Rob takes a USA energy chart that was featured in the Junk Charts blog. 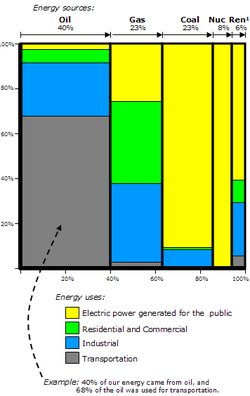 The chart is successful in demonstrating the prevailing dependance on oil for transport and coal for electricity. Of course, Stephen Few has thoughts on the strengths and shortcomings of Marimekkos. He offers his thoughts in A Design Problem on his blog. Briefly, he agrees that the chart has merit and can communicate useful messages, but he concludes that the better option is to provide multiple, simpler charts on one canvas. Of course, SAS can do this too, so it's good to see that SAS practitioners can benefit from Stephen's advice. PROC GAREABAR offers a new set of opportunities for presenting your data and communicating its messages. I shall be sure to consider using it the next time I find myself doing some data visualisation. The name Marimekko is derived from a style of clothing design made popular by the Finnish company of the same name. In an earlier posting I mentioned the SAS Talks session on Enterprise Guide scheduled for December 17th. If, like me, you missed it, you can catch-up with the recorded version (and answers to those questions that were not immediately provided during the recording). See Chris Hemedinger's recent post on his SAS Dummy blog.